A fascinating collection dedicated to the trains that have written legendary pages in the history of railways: from the mythical Orient Express to the TEEs that have crossed all the countries in Europe, from The Ghan, the exotic Australian train, to the Kiruna-Narvik designed to operate in Arctic regions. The models in Z scale (1:220), one of the official scales of railway modeling, include locomotives and wagons and feature a high level of detail and accurate colors. 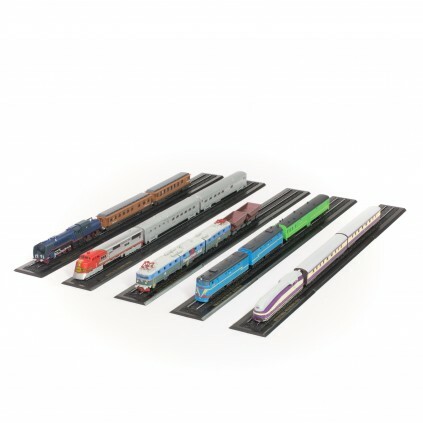 A series ideal for collectors: each model comes complete with a base with the name of the train and an elegant box. 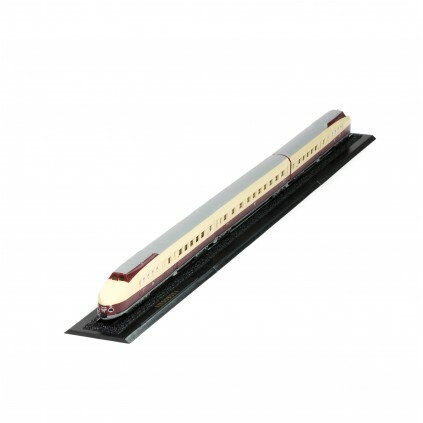 ORIENT EXPRESS 1906: The legendary Orient Express from 1906. 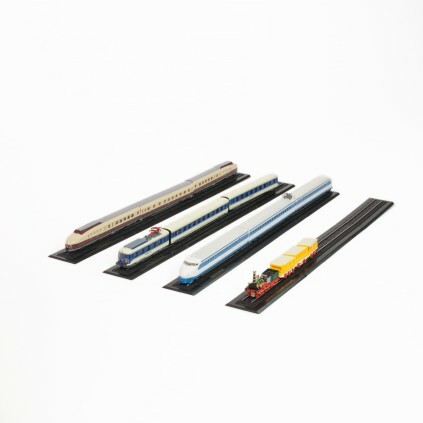 Configuration: Bavarian S 2/6 locomotive, dining car and sleeping car. Z scale (1:220) model with metal chassis. Complete with display base with tracks and box. TEE EDELWEISS: In service in 1957 between Zurich and Amsterdam. 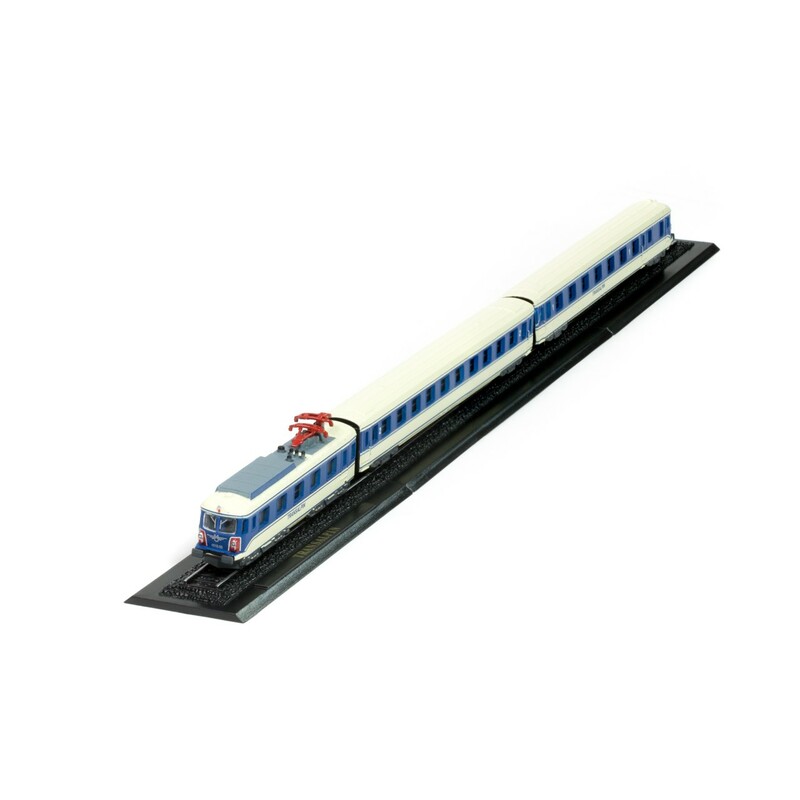 Configuration: RAM engine, passenger car and dining car. 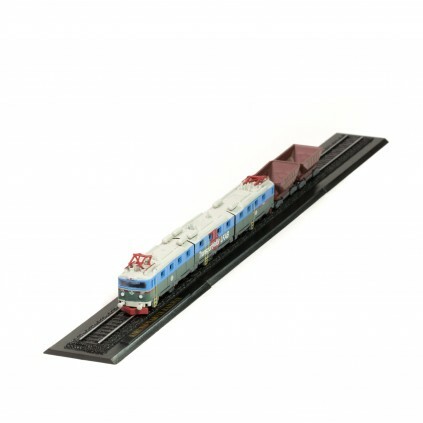 Z scale (1:220) model with metal chassis. Complete with display base with tracks and box. TRANS-SIBERIAN: Train from the famous Russian Trans-Siberian line. Configuration: TE7 engine and car. Z scale (1:220) model with metal chassis. Complete with display base with tracks and box. RHEINGOLD: Train in service along the river Rhine between 1928 and 1939. 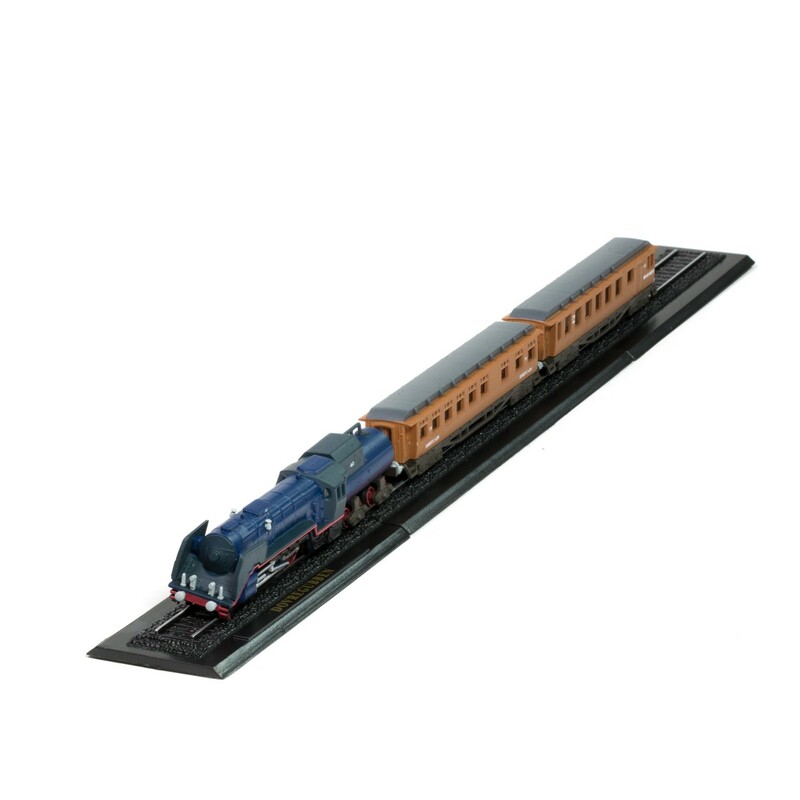 Configuration: German BR 18.3 locomotive with tender, 1st class car and 2nd class car. 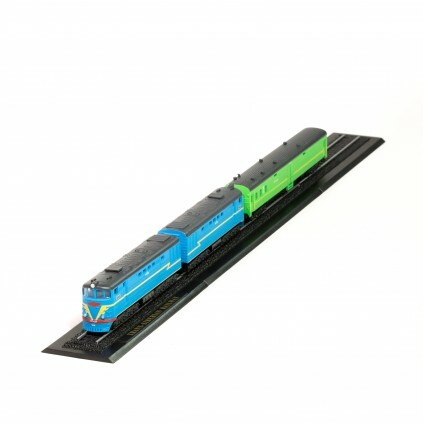 Z scale (1:220) model with metal chassis. Complete with display base with tracks and box. SVT 877 HAMBURG FLYER: Elegant and modern German train from 1933. Configuration: diesel rail car with two wagons, SVT 877a and 877b. Z scale (1:220) model with metal chassis. Complete with display base with tracks and box. 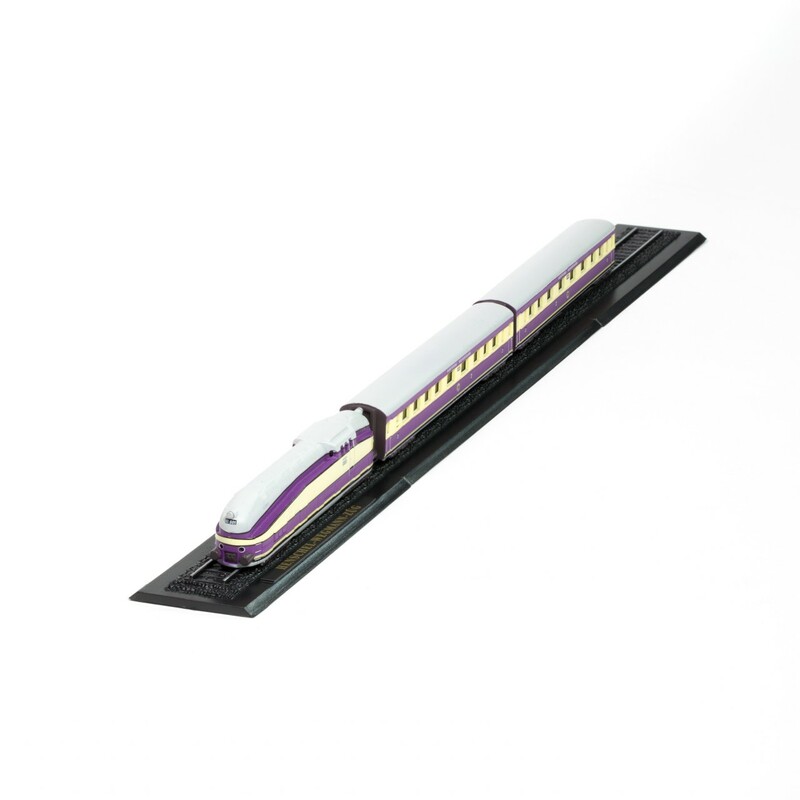 TOKAIDO SHINKANSEN: The legendary Japanese Shinkansen, the first high-speed train in the world. Configuration: power head and tail, 2nd class car. Z scale (1:220) model with metal chassis. Complete with display base with tracks and box. MIKADO 141 RENFE: Spanish train from 1953 with steam engine. Configuration: Mikado 141 locomotive and two 3rd class cars in teak wood. Z scale (1:220) model with metal chassis. Complete with display base with tracks and box. MISTRAL: Fast French passenger train in service between Paris and the Cote d’Azur. 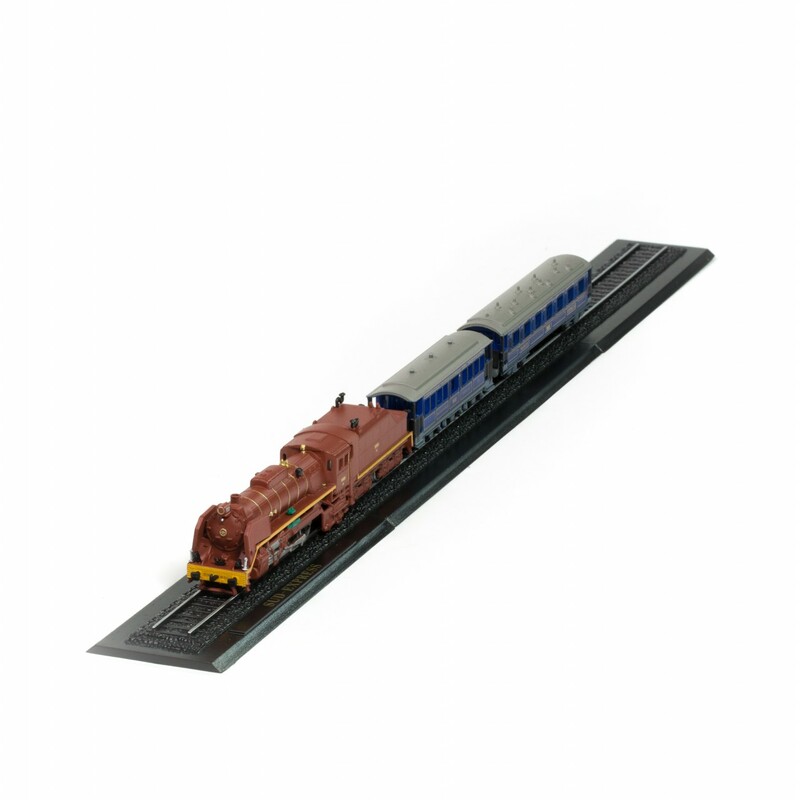 Configuration: CC 7107 locomotive and two Mistral passenger cars. Z scale (1:220) model with metal chassis. Complete with display base with tracks and box. VINDOBONA: Modern East German diesel train in service between Berlin and Vienna. Configuration: VTa and VTb power head and tail, VMc dining car. Z scale (1:220) model with metal chassis. Complete with display base with tracks and box. KIRUNA-NARVIK: Train in service in the far north, powered by an impressive Dm3 locomotive. Configuration: triple Dm3 locomotive and two mineral transport cars. Z scale (1:220) model with metal chassis. Complete with display base with tracks and box. ÖBB TRANSALPIN: Prestigious Austrian train in service between Vienna and Basel. Configuration: 4010 locomotive, 1st class car and 2nd class car. 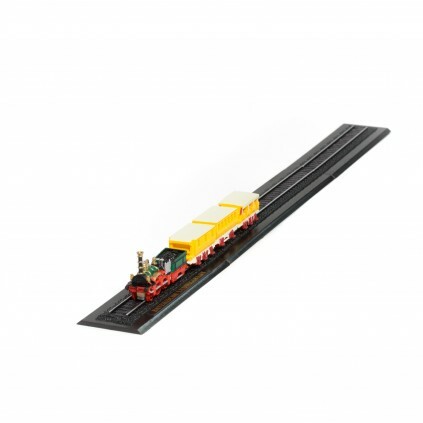 Z scale (1:220) model with metal chassis. Complete with display base with tracks and box. LUDWIGSBAHN – BAVIERA: The historic Adler locomotive in service in Nuremberg in 1835. 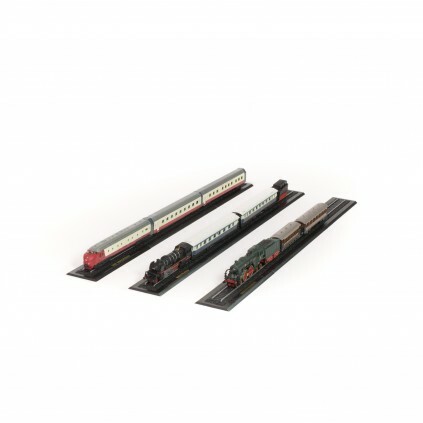 Configuration: Adler locomotive with three cars, 1st, 2nd and 3rd class respectively. 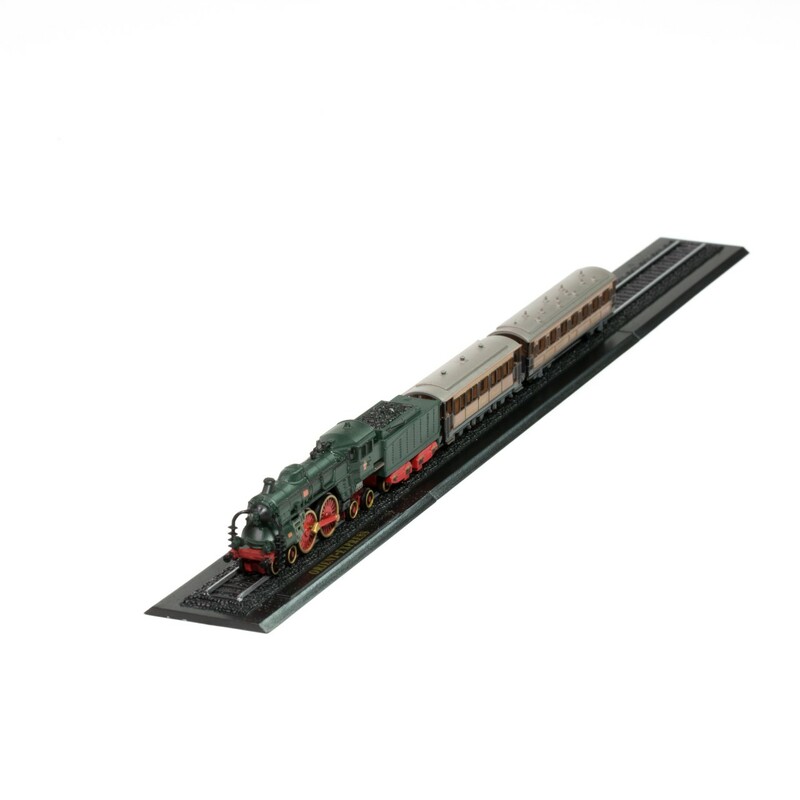 Z scale (1:220) model with metal chassis. Complete with display base with tracks and box. THE GHAN: Australian train in service between Darwin and Adelaide. 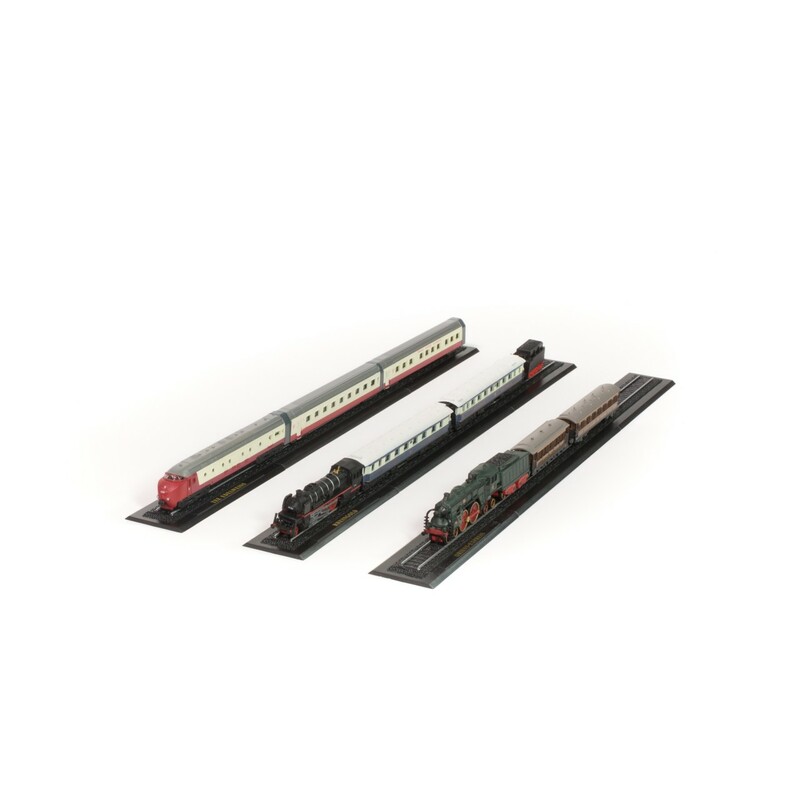 Configuration: NR 75 locomotive, dining car and sleeping car. 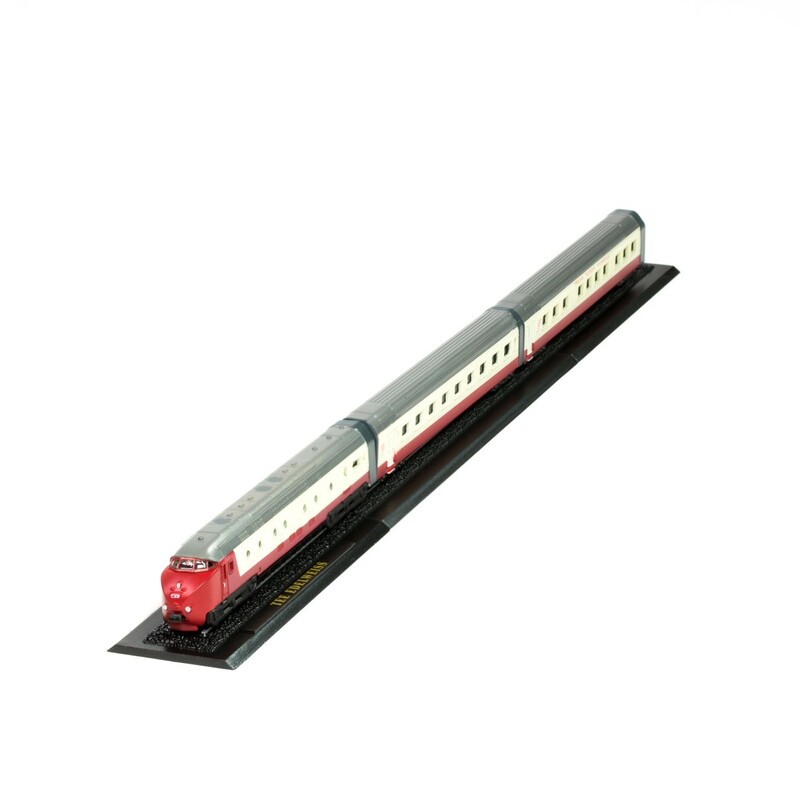 Z scale (1:220) model with metal chassis. Complete with display base with tracks and box. SANTA FE SUPER CHIEF: Fast, imposing American train from 1937. 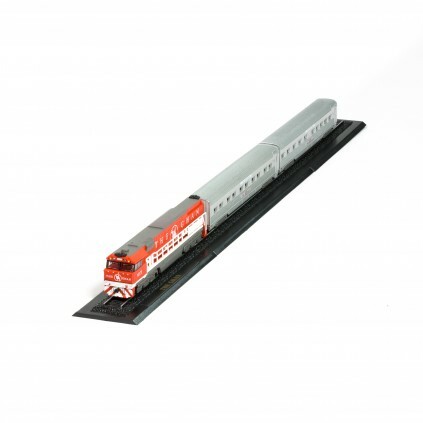 Configuration: EMC E1 locomotive, dining car and passenger car. 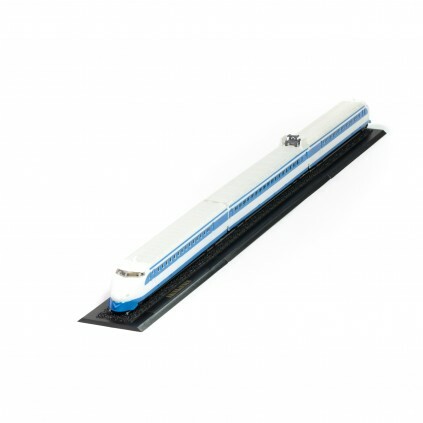 Z scale (1:220) model with metal chassis. Complete with display base with tracks and box. DOVREGUBBEN: Norwegian train powered by the biggest steam engine ever built in Norway. 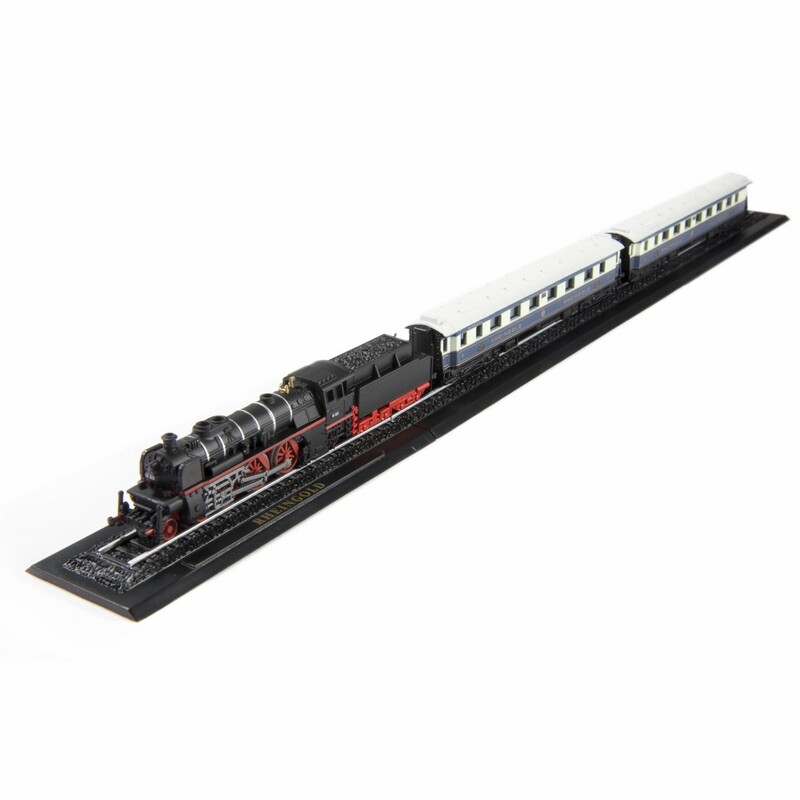 Configuration: 463 locomotive with tender, dining car and passenger car. Z scale (1:220) model with metal chassis. Complete with display base with tracks and box. HENSCHEL-WEGMANN: Fast and innovative German steam train from 1935. Configuration: No. 61 001 locomotive and two cars, SBC 4ü 10 403 and SBC 4ü 10 404. 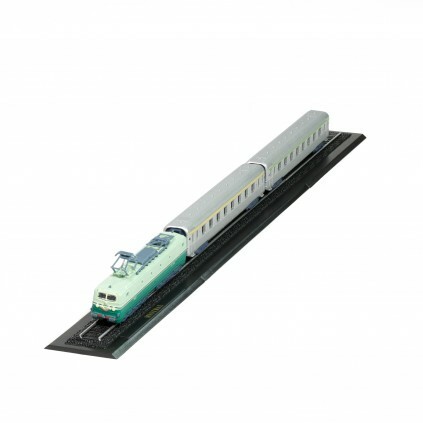 Z scale (1:220) model with metal chassis. Complete with display base with tracks and box. SUD-EXPRESS: CIWL train in service between Paris and Lisbon in the version from the 1920s. 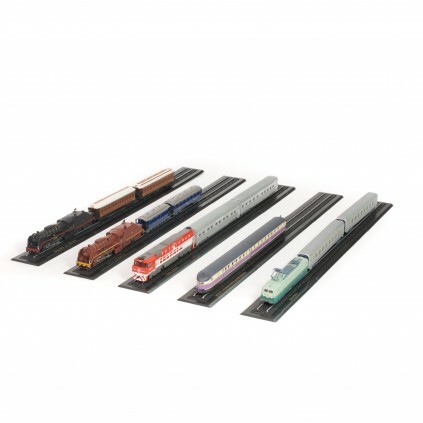 Configuration: Mikado 141 R 466 locomotive, dining car and sleeping car. Z scale (1:220) model with metal chassis. 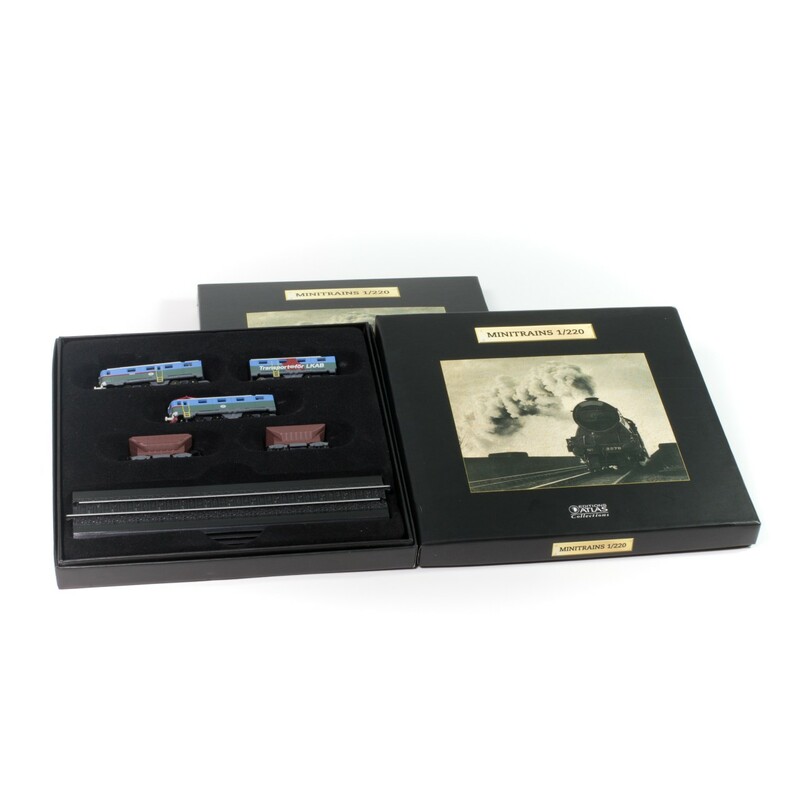 Complete with display base with tracks and box.